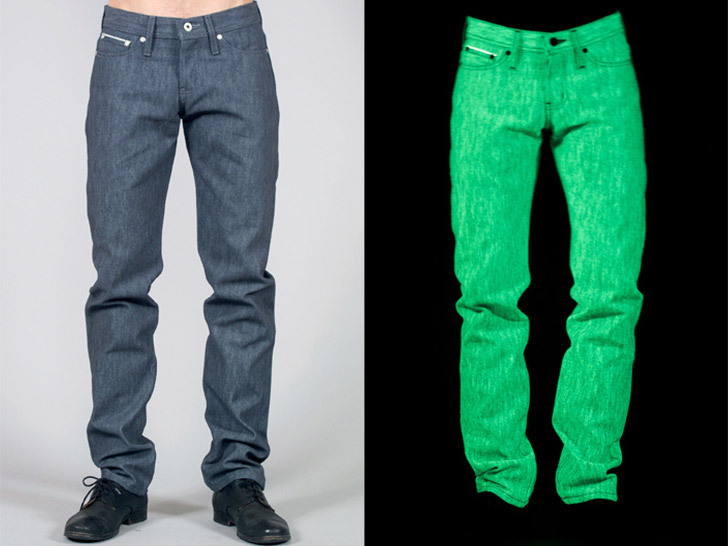 Glow-in-the-dark jeans for nocturnal cyclists? Sure, why not. Naked & Famous, a “rare and raw” denim label from Canada, applied a phosphorescent coating to indigo rope-dyed selvedge Japanese denim to imbue it with an unearthly radiance when the sun goes down. Ethically manufactured in the Great White North—and hitting shelves at Barneys New York come July—the jeans have stood the test of five laundry cycles and are still glowing strong. While the dungarees would fit in perfectly at a rave, they’re undeniably better-looking than those bright orange visibility vests. Want to ride your bike to a rave? Even better. Glow-in-the-dark jeans for nocturnal cyclists? Sure, why not. Naked & Famous, a "rare and raw" denim label from Canada, applied a phosphorescent coating to indigo rope-dyed selvedge Japanese denim to imbue it with an unearthly radiance when the sun goes down. Ethically manufactured in the Great White North�and hitting shelves at Barneys New York come July�the jeans have stood the test of five laundry cycles and are still glowing strong. While the dungarees would fit in perfectly at a rave, they're undeniably better-looking than those bright orange visibility vests. Want to ride your bike to a rave? Even better.